The Economic Cooperation Organization is an intergovernmental regional organization established in 1985 by Iran, Pakistan and Turkey for the purpose of promoting economic, technical and cultural cooperation among the member states. It was the successor organisation of what was the Regional Cooperation for Development (RCD), founded in 1962, which ended activities in 1979. In the fall of 1992, the ECO expanded to include seven new members, namely Afghanistan, Azerbaijan, Kazakhstan, Kyrghyzstan, Tajikistan, Turkmenistan, and Uzbekistan. The Economic Cooperation Organisation Trade Agreement (ECOTA) was signed on 17 July 2003 in Islamabad. And also, the third flag from left to right seems unknown to me. Other pictures of the same meeting can be seen here: Image 1, Image 2, and Image 3. For additional information please go to: ECO (official website). The third flag is of Shanghai Cooperation Organization. 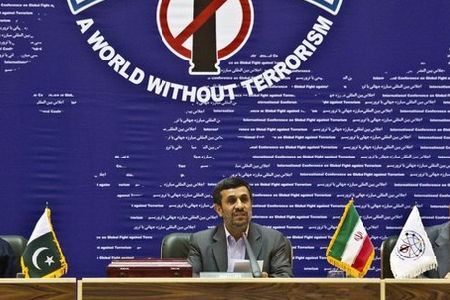 In the above mentioned picture one can also see the flag of the "A World Without Terrorism" (first flag from left to right), which seems to be an initiative of this ECO group. 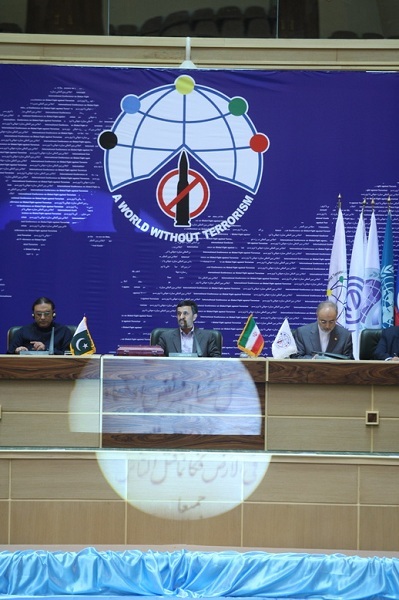 A World Without Terrorism conference flag is also white with its logo.